Taskstream is a cloud-based software solution that allows users to create e-portfolios that demonstrate their skills and accomplishments, and to submit their work online for assessment and accreditation. For more information about TaskStream, please see the TaskStream website. 2. On the left hand side panel, expand Planning Resources and click TaskStream. 3. 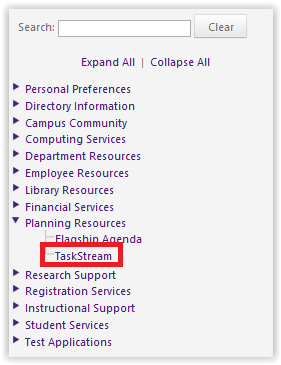 If you already have access to TaskStream, you will be automatically logged in. 4. If you do not have access, you will be directed to a log in screen. Please contact Tori Greenwood at tgreen4@lsu.edu to request access. NOTE: You will not need a key code. When your access has been approved and TaskStream account created, you will be automatically logged in when you select TaskStream through the myLSU Portal.